I can remember admiring the cheerleaders from the bleachers. I sat with the marching band with my piccolo in my hands. I marveled at the tumbling, toe touches and spirit of the squad. There were times I wished that I could be on the team, except that I have no rhythm when it comes to dance. So I never tried. Instead, I played ‘Mony Mony’ and ‘Live and Let Die’ for the cheerleaders as they knocked out another awesome routine. Even though a little piece of me wanted to be out there with them, my love for music squashed that desire and I was content to be where I was. Anything that promotes Jesus I get excited about. Our church campus is a host to the league. How could I say no? 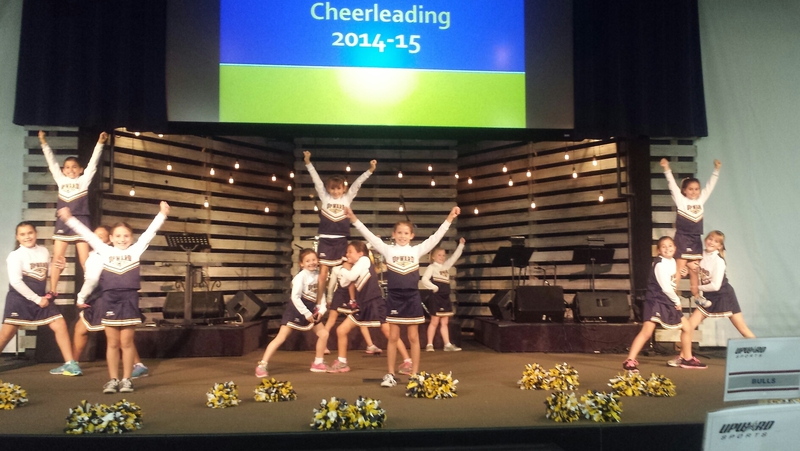 A week after registration, I received an email from the cheer commissioner explaining that they needed coaches. Not one parent had volunteered. I couldn’t imagine the disappointment of not being able to cheer just because they were lacking help. Hesitantly, I responded by offering “to assist” whatever coach they did find, with a HUGE warning of “I HAVE NO IDEA WHAT I AM DOING!” Imagine my surprise when I arrived at the training meeting to find out that only myself and one other mom had volunteered. There were two teams. That meant I had my own squad, WITH NO HELP! Ahh! Immediately, I felt intimidated and reiterated to the commissioner that “I HAVE NO IDEA WHAT I AM DOING!” His response was simply, “Don’t worry. It’s Upward. You can do all things through Christ who strengthens you…” Aww snap. He was right. Never, in my wildest dreams did I ever expect to be a cheer leading coach. I walked away with mixed feelings, fear and worry being among them. I wanted the kids to have a great season. I didn’t want to let them down and I didn’t want to disappoint their parents, after all, they paid hard earned money to have their child learn a skill. Besides the sport experience, these little ladies were also there to grow in their spirituality. Upward includes a devotion during each practice, teaches a bible verse and always closes in prayer. Among feeling a little inadequate for the job, I had to teach Bible lessons and….dun dun dun…pray out loud. I prayed all the time, to myself, in my head, where I was comfortable and safe. Now I would be praying in front of others, possibly to some kids that have never prayed before or even heard of Jesus. 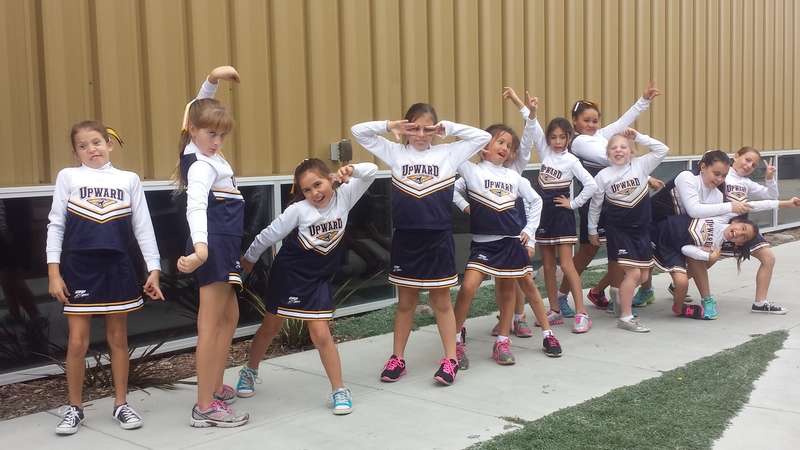 I never expected to fall head over heels in love with each one of my little cheer leaders. I never expected these sweet ladies to get excited when they’d run into me somewhere other than cheer. They’d pull on their parents coats and I could see them whisper, “It’s coach Darla!” A smile would come across their dimpled cheeks and they’d dash over to give me hug. I never expected to cherish all of the homemade crafts embellished with their favorite stickers that they’d bring me. I love it when my own children do this for me, but someone else’s? Most certainly. They are all tucked away safe in my cheer keepsake box (yes, I have one). I never expected to cry tears of happiness when one of them would reach a goal they had been working on. It didn’t matter if it was a jump, a cartwheel, toe touch or memorization of a bible verse that they had struggled with, it was awesome! When I’d see their eyes light up and a smile beam across the face, I could hardly contain my excitement for them. I never expected to feel 100% confident in my ability to pray out loud. During one practice, I asked the girls if one of them would be willing to pray out loud. I had a brave volunteer. She held up her three fingers and began to recite the Girl Scout Pledge. I realized then that this little one had never been to church, never opened a Bible yet, God placed it upon her heart to pray. She showed me courage and the willingness to learn. By the end of the season, she was a prayer warrior. I never expected to grow in friendship with the other cheer coach, Kimberley. We learned to work together, using each one of our strengths where the other was weak. I never expected to learn how to dance, and I still haven’t! Ha! But I can yell and learn and teach cheer routines. Thank God Kimberley is gifted with choreography! I never expected our cheer leading coaches to double this last season. Even more friendships were formed and we quickly learned how to work great together. We went from two to four which allowed each of us to use our spiritual gifts. 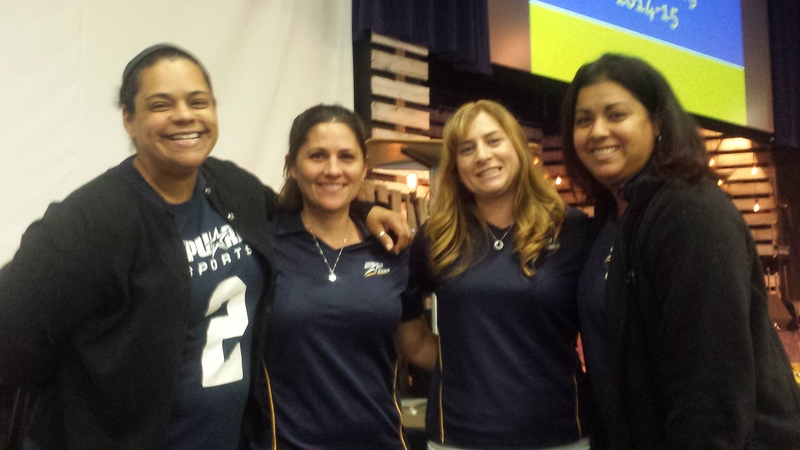 Coach Tina is amazing at teaching the ladies about the Lord. She has an ability to get the girls excited to learn and each and every single one of them were able to memorize every single verse! Coach Vanessa is awesome at precision. She’s able to spot a crooked arm or a twirl in the wrong direction. The girls loved her and always greeted her with a hug. I never, not even in my wildest dreams, would have ever expected to become a cheerleading coach. I certainly never thought I would love it as much as I love the ministry it serves. Its proof enough that God’s plans aren’t always my plans. I am so grateful for that. So there you have just a few tidbits of all the awesomeness that can come out of a couple seasons. If you are on the fence on whether or not you should volunteer, pray about it. My hunch is that if you are even considering it, it’s God prompting you to say yes. You’ll be so glad you did. This entry was posted in cheerleading, childhood, coaching, faith, god, parenthood, Sports and tagged cheerleading, christ, church, coaching, ministry, prayer, prayer warrier, Upward sports. Bookmark the permalink.